So, when ChumpCar posted COTA on the schedule, that became a must do event. We sent our entry fee in right away. The 1005 mile tow out there was just the first of many obstacles. We decided to give Bertha (our 1500 Suburban) a rest and use Evan’s turbo Diesel RAM pickup. While this gave us less room to pack stuff, it made for a much quicker trip across the country. Evan dropped the truck off with us a couple weeks early and then flew into Austin to meet us. We broke up the trip out with an overnight stop just past Houston. This stop allowed us to roll into the track early and refreshed on Thursday morning. With this being a Formula 1 track the garage layout is different from NASCAR tracks and the road courses we have run before. The garages are where pit stops are made on F1 so they are on pit road. We paid the steep price and rented a garage space and were glad we did. By arriving when we did, we were also able to reserve the pit stall right in front of our garage. This logistics made the weekend much more pleasant. We did not have to keep all our gear and chairs under a 10 x 10 ez up. We kept most things neatly arranged in the garage and only the items actually needed for fueling out by the wall. Speaking of the wall, F1 normally does not use one. But ChumpCar arranged to have some concrete barriers placed so we had the kind of wall we were accustomed to working with during pit stops. We were having a nice time feeling relaxed and well prepared for the race. We spent time catching up with ChumpCar officials and getting to know our garage mates. We had all our gear organized in the shared space. We were looking for a place to fuel the car safely and decided it would be easiest to just drive it to the gas station. This would get Evan some seat time before the race. We were all relaxing when I got the call that after fueling the car would not start. 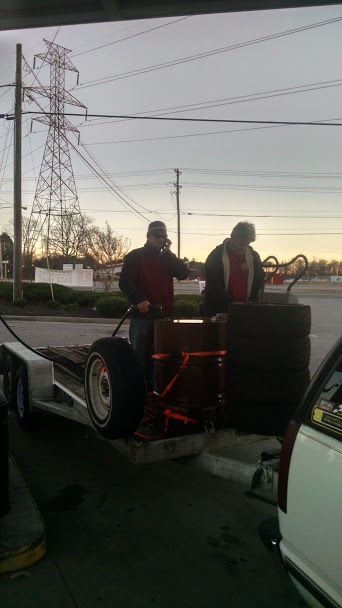 We ended up taking the trailer and pushing the car on. It was obvious to me that the ECU was not getting power. But why was not so apparent. We checked all the fuses and grounds that had been disconnected during the recent engine swap. We swapped DME relays. We even swapped DME units. Still no tach bounce at start. I remembered a similar failure in our Sentra race car and began the process of pulling the center mounted kill switch out of the dash. We never use this one – it is only there because the rules require it. The last time it was used was at annual tech in February. Once it was out of the dash, the ohm meter told the story. The aux contacts were not working. Once found that was an easy fix and we were much relieved when the car started right up. As annoying as that was, we were all glad it happened before the race and not during. We were able to get it repaired without losing race time. On Friday morning at the start of the race we were all a bit nervous since our last two trips to the track had ended in catastrophic engine failures. (One in the Porsche one in the Celica) The price list for cleaning the track at COTA added to the nervous feeling. Tom took the car out first and we were very happy to see the car not only holding together but keeping pace with the other race cars. We had all agreed to take it easy on the car during the first stints. Learning 20 turns on the huge track was a challenge at first. But due to the wide track and flowing nature, Tom settled in quickly. 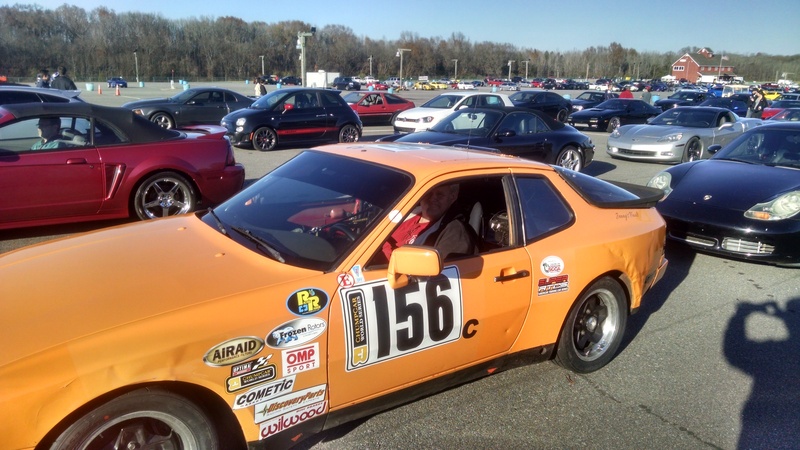 We ran short stints and fueled every other stop to equal out the driving time for each of us. Evan took over next and other than a couple spins had a good run. He kept us up in the mid pack standings. I took over after fuelling and tried not to lose too much ground as I learned my way around the track. In Evan’s second stint we had relaxed and were sitting the garage cooling off and chatting. There had not been any radio chatter so we were not really paying attention. Suddenly we saw our orange car enter the garage. The Push to Talk button had come loose on the radio and Evan could not tell us the car had stalled on course and had to be towed in. As soon as we popped the hood the cause was obvious. The air pipe from the air speed sensor to the intake had come loose. 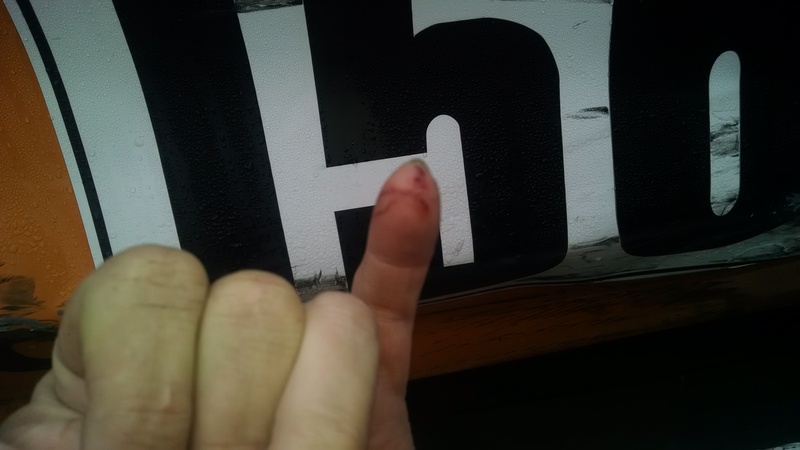 A flat blade screwdriver fixed that right away and he was back racing after losing several laps. The car was running great when I took over for the final stint. However with about 45 minutes left in the race I felt something come loose in the front suspension. I heard parts come loose but the problem was intermittent. Most of the time the car handled fine but occasionally it would make at thunk sound and dart around. It was particularly bad in left had turns. Since COTA is a counter clockwise course, there are a lot of those. I decided not to take continue the risk and brought the car in for inspection. It took quite a while but I finally found the problem. The bottom of the ball joint socket had come out of the control arm. This part is normally held in by a clip and with epoxy. But somehow ours escaped. 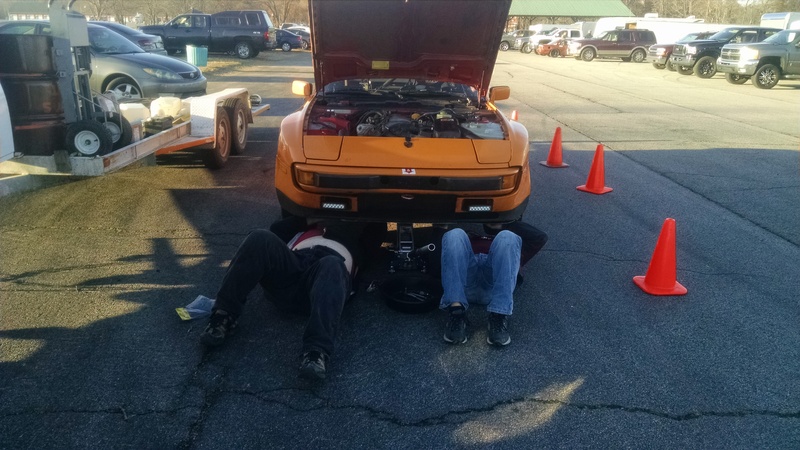 We polled the other 944 teams but no one had a spare control arm that would fit our car. We really did not want to pack up and miss the second race so I started working on a way to make what we had work. I still had the nylon bearing surface so all I needed was something to hold it in place. I found some washers and was able to modify them to support the bearing. I just needed some way to hold it all together. An internet search said O’Reilly’s sold C clips so we followed google maps to the nearest one. The look on the face of the counter guy was what you would expect if you have ever tried to get special parts at a chain parts store. He directed us to the Help isle. Nothing there was anywhere close to large enough. He kept insisting there was nothing he could sell us that would work. I then asked him if he stocked ball joints for Jeeps. I knew they came with a clip that never gets used. He very reluctantly brought one out and let us buy the ball joint. 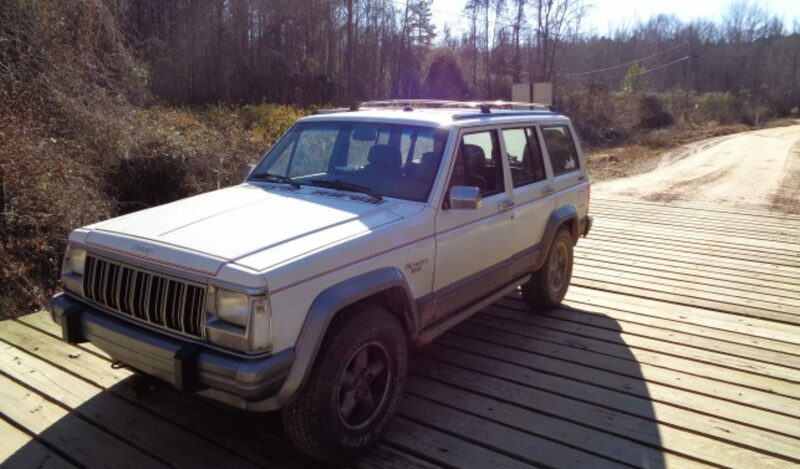 Worst case I would have a spare for the Jeep. We also picked up some JB weld epoxy. Tom used his Dremel to cut down the snap ring until we could work it into the groove on the bottom of the control arm. Then we used vise grips, clamps and a hammer to force it in place. We then filled the cavity with JB weld and headed to dinner for it to set up. The Epoxy was still soft when we got back, but we covered it with metal tape and reinstalled the control arm anyway. We hoped it would be cured by morning. We got to the hotel much later than planned. I decided to take the first stint to see how the ball joint would hold up. I was very tentative for the first few laps but quickly gained confidence. I still avoided the rumble strips as much as possible. The car ran great all day. We managed to finish 34th overall out of over 100 entries. I was very happy to finish a race again with no technical difficulties. Our homemade cool shirt system was not quite up to the 100 degree heat but really did help a lot. We got good at changing the cool shirt ice and checking the oil on each pit stop. I felt like we were much more organized on our stops than some of the teams around us. We even remembered to keep our visors down during the fuel stops. 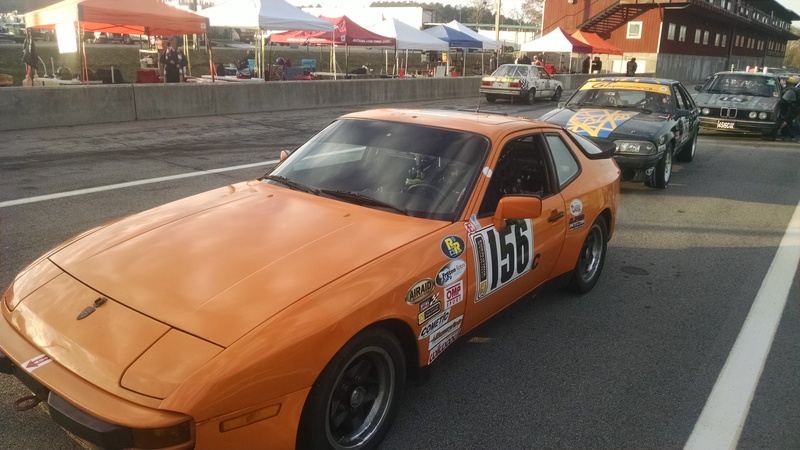 The other 944s entered in the race had problems so we ended up the highest finishing 944 even though we were not the fastest. The Cone Crusher team had been running in second place overall when they blew their engine on Friday. They swapped engines over night and were running well on Saturday when they lost a ball joint. 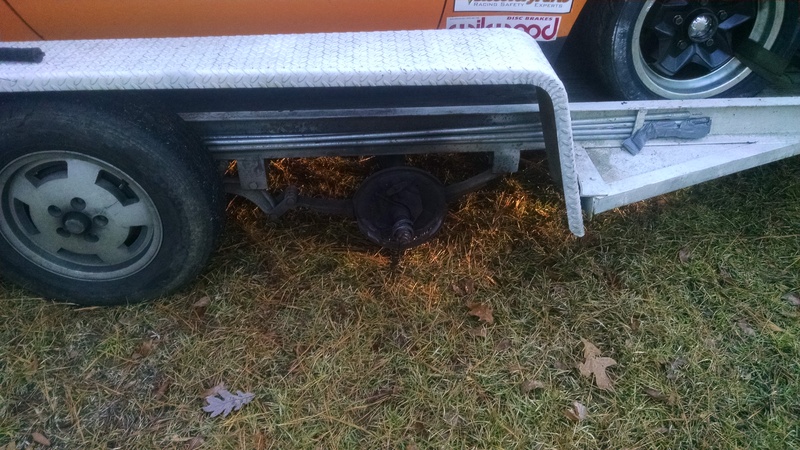 They got towed in but it failed completely while loading the car in their trailer damaging the fender. The Burningham 944 had oil cooling issues and then eventually had transmission problems that took them out on Saturday. 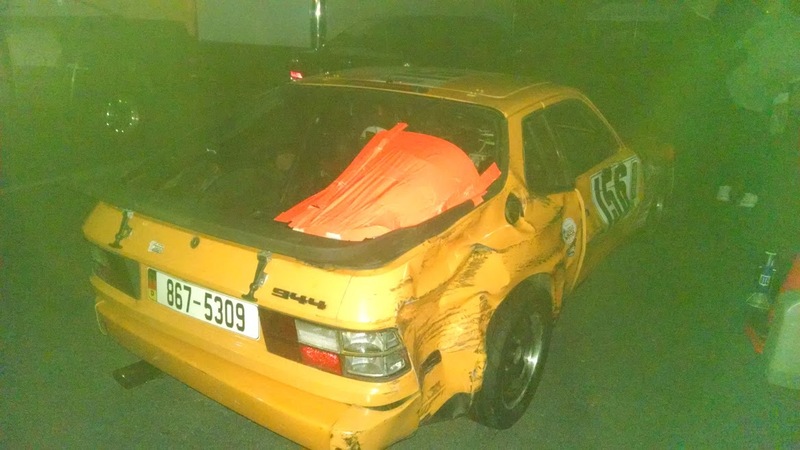 The #195 Turbo 944 had a scary brake failure and lost a lot of laps being extracted from the gravel pit. Luckily there was no major damage from his off course excursion. The track design played a large role in his ability to get the car stopped before hitting anything solid. 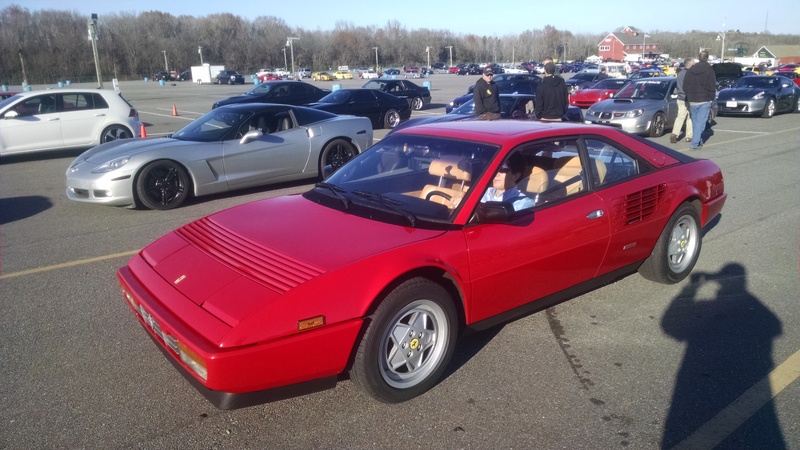 The Porshalump 944 was on the entry list but was sadly a no show for the event. We made the trip home in 15 hours with Evan Driving Big Momma Diesel. Now to get our sweaty race suits cleaned and the car inspected to be ready to race VIR in the December. I will add more pictures and Video – check back for updates.